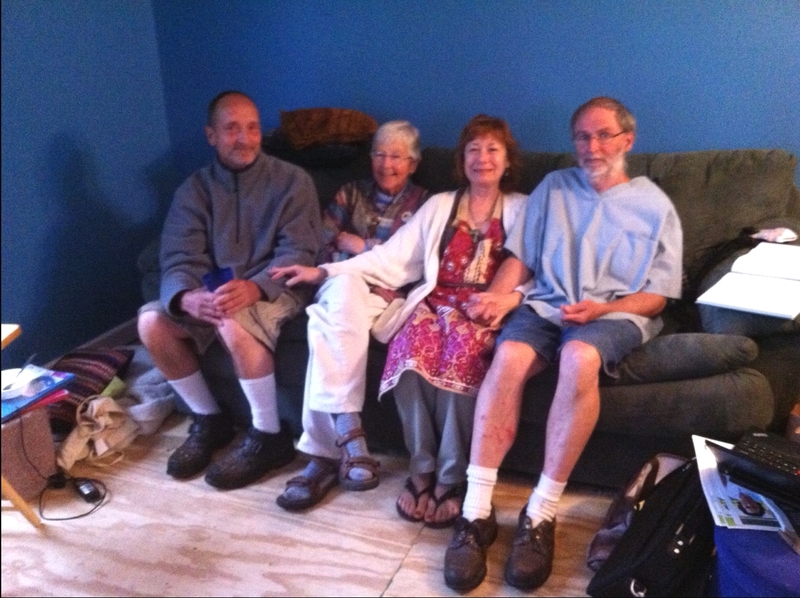 Prophets for Social Justice: Mike Walli, Sr Megan Rice and Greg Boetje-Obed with Janice Sevre-Duszynska, ARCWP in Knoxville, TN. Transform Now Plowshares Activists:Mike Walli, Sr Megan Rice and Greg Boetje-Obed with Janice Sevre-Duszynska, ARCWP in Knoxville, TN. Let us pray that the message of these contemporary prophets for peace and justice will wake up the conscience of all in our nation and world not only to weapons as false gods but to the sin of profiteering from the accumulation of nuclear weapons that could desroy our planet hundreds of times over. This is insanity. I thought we were getting rid of these huge stockpiles. for the full equality of women in the Roman Catholic Church. "The first millennium of Christianity was marked by the paradigm of community. The Churches had relative autonomy regarding their own rites: Orthodox, Coptic, Ambrosian from Milan, Mozarabic, from Spain, and others. They venerated their own martyrs and confessors and had their own theologies, as seen in the flourishing Christianity of North Africa with Saint Augustine, Saint Cyprian and the lay theologian Tertullian. Those Churches recognized each other, and even though a mostly juridical vision in Rome was already appearing, the primacy of charity predominated . The Reformation will not be restricted to the Roman curia, that is in a calamitous state, but will be extended to the entire institution of the Church. Perhaps only by convoking a new Council, with representatives from all of Christendom, will the Pope have the security and the master lines of the Church of the Third Millennium. May the Spirit not fail him." The president of Germany's bishops' conference has called for the creation of a new, specific office for women deacons. Archbishop Robert Zollitsch told delegates at a four-day conference in his Freiburg archdiocese on church reform: "I will promote further in-depth study of the common priesthood of all the faithful, encourage diversity as far as church ministries and offices are concerned and I will do so based on the Church's teaching. This will include promoting new church ministries and offices which will be open to women as, for example, a specific deacon's office for women." But a spokesman for Cardinal Reinhard Marx of Munich, whom Pope Francis has appointed cardinal-adviser for Europe, said ordaining women deacons was "not on the agenda". And Bishop Rudolf Voderholzer of Regensburg said the office of deacon was inseparably bound to that of priest and bishop and the sacrament of ordination, and the "tradition that only men can be ordained is based on the Bible". 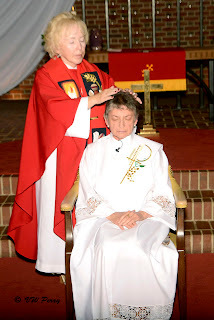 Today we rejoice because Rosemarie Smead will be ordained as a Roman Catholic Woman Priest in the first ordination of a woman priest in Louisville, Kentucky, in St. Andrew United Church of Christ. We are gathering at a new moment of historical possibilities and challenges in our church. We pray that Francis, the first Latin American and first Jesuit pope, who washed the feet of young women and men in a juvenile detention center, will usher in a new era of justice for all, especially for those on the margins including women in our church. The news report that Pope Francis plans to appoint more women to top positions in the Vatican is welcome, indeed! There is certainly a long list of qualified women, including many nuns and women priests, who are ready to serve in the renewal and reform of our church. In Luke 13:10-13, Jesus encounters a woman in the synagogue on the Sabbath who, for 18 years, has been crippled with a condition that causes her to be bent over, incapable of standing up straight. When Jesus saw her, he called her over and said, “woman, you are free of your infirmity.” he laid his hands on her, and immediately, she stood up straight and began thanking God. 2) People have priority over rules and regulations. 3) Sexism in church and society is sinful and should always be challenged. 4) Our compassionate god lifts up all women bent over by the burden of patriarchy. The good news is that the Spirit of God continues to set us free today to live gospel equality and partnership. Now, in the 21st century, women are silent and invisible and subordinate no more! If women priests were partners in decision-making in our church, there would be some mighty big changes in church teachings like birth control! According to a 2012 Newsweek interview with catholic Melinda Gates, 100,000 women annually die in childbirth after unintended pregnancies and six hundred thousand babies die in the first month of life. A prolife church must value women’s health and well-being. During her long professional life, Rosemarie has worked tirelessly to model Jesus’ healing presence in the lives of women and girls, and to teach the value of standing up for justice no matter what challenges they encountered. Maryknoll Roy Bourgeois, Franciscan Jerry Zawada, jesuit Bill Brennan, Redemptorist Tony Flannery, the Irish Priests Association, and the Austrian Priests’ Initiative have endured condemnation and punishment by the Vatican for their solidarity with the women priests’ movement. but the hierarchy of the Catholic Church cannot stop justice from rising up in the people of God! In a recent poll in the U.S. 70% of Catholics support women’s ordination. Our women priests start a new inclusive catholic community in their home areas, that honors the gifts of God in the people of God, bringing a renewal and reforming presence to enliven our beloved church. 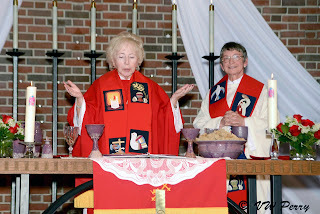 our women priests from Lexington, Janice Sevre-Duszynska and Donna Rougeux, are assisting Rosemarie with this new church community started here in Louisville. it is called “Christ-Sophia Inclusive Catholic Community.” You are all warmly welcome to celebrate the sacraments as God’s embracing extravagant love for all in our midst. The bible uses feminine imagery to describe God who is beyond all names and images. This is one of the church’s best-kept secrets! The books of Wisdom and Proverbs use feminine imagery to describe divine wisdom. the Greek word for wisdom is Sophia and is always personified as a woman. Our first reading is from the book of wisdom and refers to the holy one as she. The New Testatment identifies Christ with the wisdom of god. “…to those who are called… Christ is the power and the wisdom of God.” (1 cor. 1:24) The connection in scripture is made between the crucified Jesus of Nazareth and the Cosmic Risen Christ in Christ-Sophia. In this liturgy today we integrate this powerful image of Christ Sophia in our prayer and song. Thanks to our music director, Kathleen Rosenberg, for the beautiful musical mass of Christ Sophia which she composed. And now, i would like to share a brief overview of the Roman Catholic Women Priests Movement. 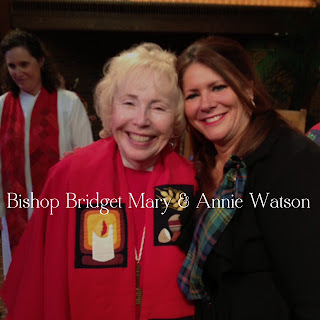 Roman Catholic Women Priests are ordained in apostolic succession because a male bishop with apostolic succession and in communion with the pope ordained our first bishops! 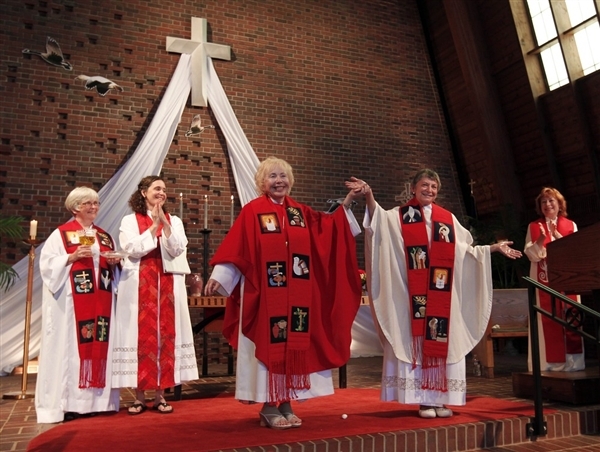 In 2002, 7 women were ordained on the Danube. In 2006, 12 women were ordained in the first U.S. ordination in Pittsburgh. Now there are approximately 150 in our movement in Europe, U.S. Canada, and Latin America. As part of an international initiative of the Roman Catholic Women Priests movement, the Association of Roman Catholic Women Priests claims equality as a human right. Our vision is justice for all, justice for the poor, justice for women, and justice for women in the church including ordination. I believe that on a deep spiritual, mystical level women priests are beginning a healing process of centuries-old deep misogyny in which spiritual power was invested exclusively in men. For some, like the Catholic hierarchy, women priests are a spiritual uprising. For millions of people, the time has come for a holy shakeup that will bring new life, creativity and justice to the church and beyond. Let us pray that Pope Francis will join this holy shakeup! Amen, Rosemarie, to rocking the boat of Peter and walking on water with Christ! i guarantee that you are in for quite a spiritual adventure! Like the woman who was healed in the gospel, we are set free to work for justice and to live gospel equality and partnership now! 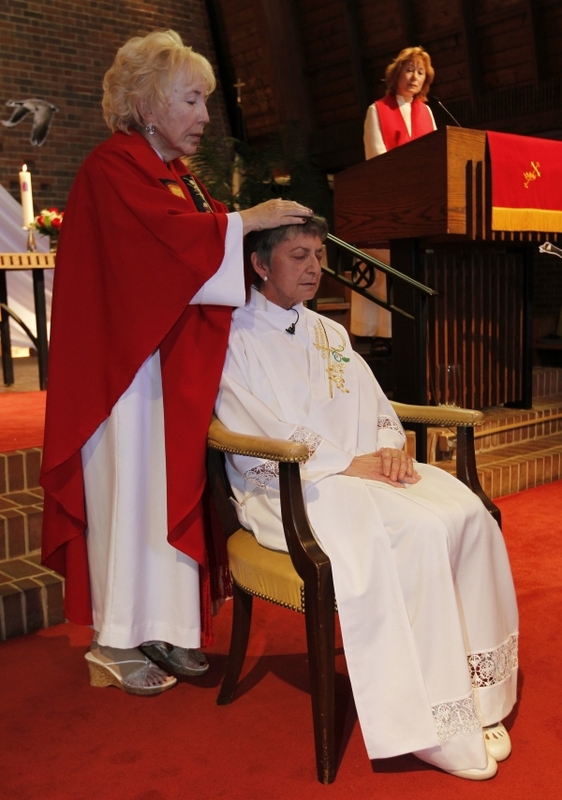 Rosemarie Smead's Ordination: Video Clip of Recessional "We Are Marching/Dancing In the Light of God"
NCR Today: "It is beyond infuriating," the editorial states. "... He should resign immediately and apologize to the families whose children he left exposed." Above is link to live radio show. Alan Colmes will do a quick interview with Rosemarie Smead about her ordination this weekend in Louisville. Turn it on around 7 p.m.
2 hours ago – A dissident Roman Catholic group ordained a 70-year-old woman a priest in ... Kentucky woman ordained as priest by dissident Roman Catholics ... and she told Reuters she is not worried about being excommunicated.